Three men were charged in Magistrates Court this morning [Dec 13] in relation to the murder of Haile Outerbridge and Rico Furbert at Belvin’s Variety store in January 2013. The two men were gunned down inside Belvins store on Happy Valley Road on January 23 2013. Mr Outerbridge, 34, and Mr Furbert, 25, sustained fatal wounds after being shot multiple times. The only defendant present in Court was 25 year old Christophe Duerr who chose to remain silent and not speak to Senior Magistrate Archie Warner. The other two accused – who were not present in Court — were 20 year old Leveck Roberts and 21 year old Gariko Benjamin. All three were charged with the premeditated murder of Haile Outerbridge, the premeditated murder of Ricco Furbert and using a firearm to commit murder. Separately, Roberts and Benjamin were charged with additional offences including attempting to cause the unlawful death of another person; using a firearm in that attempt and taking motor bikes without the owners permission. Duerr will remain in custody, and warrants were issued for the arrests of Benjamin and Roberts. 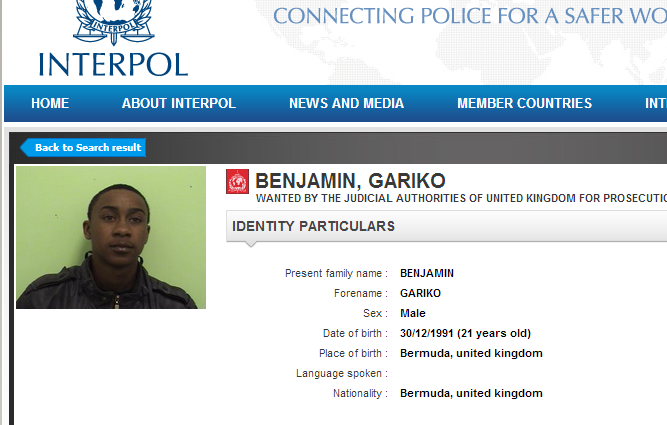 Checking the website of the international policing agency Interpol shows that a red notice has been issued for Gariko Benjamin [screenshot below]. The Senior Magistrate set 27th December 2013 as the next mention date for the accused. - Due to legal considerations, comments will be strictly moderated. Seeing the Interpol notice brings to mind the song – Bad boy bad boy, what you gonna do. What you gonna do when they come for you. Seriously. For 2014 I wish for a more peaceful Bermuda. Our young men and women need to focus on education, working and being good citizens. Wow!!! I am going to say Innocent until legally proven guilty. My heart goes out to Gariko’s Mom. Hang in there. My thoughts and prayers are with all parents involved. Maybe your heart should go out to the ones who were murdered in cold blood also… you think? Nah I’m pretty sure that’s your liver going out. Haile n Ricco may your souls S.I.P. Missing you guys right now!!!!! This is an incident that would sadden anyone with a heart. I really hope that justice is served in the correct manner. I still think of both of the victims often, and I didn’t know any of them personally, so I don’t even want to imagine what their loved ones go through. As a close family member of Mr Outerbridge a school friend of Freddy and godmother to some of the kids who’s fathers were lost up 42nd I pray that all of the families and friends who have had to suffer due to this violence find justice. EVERYONE DESERVES JUSTICE!!!! JUSTICE FOR Rico n Child!!! To country girl your a damn fool….. R.i.p uncle star and Rico! Justice for ALL MURDERS! !